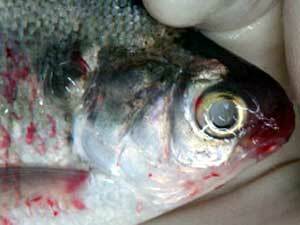 Fish with VHS may have hemorrhaging of the skin and internal organs. A newsletter released by the Michigan Department of Natural Resources, Lake Erie Management unit, has reported that Viral Hemorrhagic Septicemia (VHS) which is a deadly fish pathogen, was found in Baseline Lake near Pinckney in 2009. This is only the second time that VHS has been confirmed in a Michigan inland lake. VHS is not a human pathogen; swimming in the water, and eating and touching infected fish will not result in human infection. However, VHS can be deadly to fish populations, and state biologists are carefully watching for signs of VHS spreading across the state. Thankfully, there have been no reported fish kills in Baseline Lake, but we urge residents of the area to be aware of the issue and contact the DNR Lake Erie Management Unit (248-359-9040) if you see fish with the VHS symptoms. Fish infected with VHS may show hemorrhaging of the skin, including red patches on the skin of the head, but infected fish do not always show obvious external symptoms. Internally, hemorrhages can be found in the liver, spleen, and intestines. The fish often exhibit listless behavior, such as swimming in circles, or hanging just below the water surface. Baseline Lake is located on the border of Washtenaw and Livingston Counties, and is part of the Huron River’s Chain of Lakes region. For more information on VHS, read this fact sheet produced by Michigan Sea Grant.